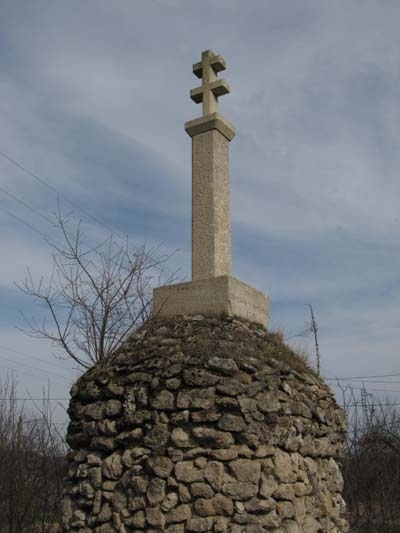 There was also a Lorraine cross (French: Croix de Lorraine) that was carried to the Crusades by the original Knights Templar. That was granted to them for their use by the Patriarch of Jerusalem. This cross appeared in the symbolism of René of Anjou, and René I of Anjou, or René I of Naples Rene or Sicily, known to his subjects the Provencal Good King René (born 16 January 1409 in Angers - died 10 July 1480 in Aix -en-Provence ) was then lord Count of Guise (1417-1425), Duke of Bar (1430-1480) actually from 1420, duke consort of Lorraine (1431-1453), Duke of Anjou (1434-1480) , Count of Provence and Forcalquier (1434-1480), Count of Piedmont, Count of Barcelona, ​​King of Naples (1435-1442), titular King of Jerusalem (1435-1480), titular King of Sicily (1434-1480) and of Aragon (1466-1480), Marquis of Pont-à-Mousson (-1480) and a peer of France and founder of the Order of the Crescent. Today, the title is held by the descendants of the hereditary Dukes of Lorraine since July 4, 2011, it is attributed to Charles of Habsburg-Lorraine (Charles VII). Lorraine (is one of the 27 régions of France. The administrative region has two cities of equal importance, Metz and Nancy. Metz is considered to be the official capital since that is where the regional parliament is situated. The region's name is derived from the medieval Lotharingia. Lorraine is the only French region to share its borders with three other countries: Belgium , the Luxembourg and Germany. In 1420, Charles II of Lorraine spends peace by marrying his daughter and heiress Isabella I of Lorraine to the heir to the Duchy of Bar , his neighbor and enemy, a French Prince René of Anjou . The Treaty of Foug states that the two duchies are now governed by the same monarch but retain their rights, customs and respective independence. I like the cross symbol used in this fashion. The double-barred cross is a modification of the Cross of Lorraine, which is itself a variation of the Jerusalem, or Patriarchal, Cross. Godfrey, Duke of Lorraine and a leader of the First Crusade, commandeered the cross in 1099 when he was made ruler of Jerusalem. In 1902 at the International Conference on tuberculosis held in Berlin, Dr. Gilbert Sersiron of Paris proposed that the Lorraine Cross be made the emblem of the anti-TB "crusade". The International Union Against Tuberculosis and Lung Disease also used this symbol as its logo from the time of its official creation in 1920 until 2002. The union logo has now been amended from just the cross (see new logo on the right of this page) but organisational members of the Union like TB Alert use the cross on their stationery to show that they are part of this international “crusade”.